Whether metformin therapy affects breast cancer risk in Asian patients with type 2 diabetes mellitus (T2DM) has not been investigated. The reimbursement databases of Taiwanese female patients with a new diagnosis of T2DM between 1998 and 2002 (n = 476,282) were retrieved from the National Health Insurance for follow-up of breast cancer until the end of 2009. Metformin was treated as a time-dependent variable; and of these patients, 285,087 were never-users and 191,195 were ever-users. A time-dependent approach was used to calculate breast cancer incidence and estimate hazard ratios by Cox regression for ever-users, never-users, and subgroups of metformin exposure (tertiles of cumulative duration and cumulative dose). 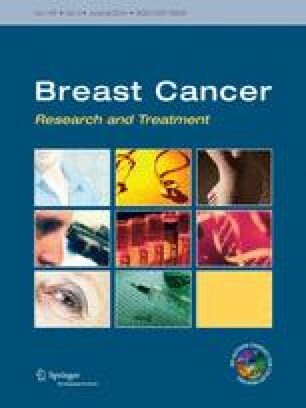 During follow-up, 2,412 (1.26 %) metformin ever-users and 9,322 (2.10 %) never-users developed breast cancer, representing an incidence of 201.08 and 535.88 per 100,000 person-years, respectively. The overall multivariable-adjusted hazard ratio (95 % confidence intervals) for ever- versus never-users was 0.630 (0.597–0.665). The multivariable-adjusted hazard ratios for the first, second, and third tertiles of cumulative duration of metformin therapy were 1.122 (1.043–1.207), 0.754 (0.692–0.820), and 0.280 (0.253–0.310), respectively, (P-trend <0.0001); and 1.099 (1.021–1.182), 0.664 (0.611–0.723), and 0.311 (0.281–0.344), respectively, (P-trend <0.0001), for cumulative dose of metformin. Metformin use is associated with a decreased risk of breast cancer.